In a sky as black as a raven’s wing, the crackles of fragrant cedar logs and long licks of flames lit up the field orange on this the blackest, longest night of the year. It was December 21st, the Winter Solstice. The bonfire danced ever hotter and ever higher lighting up cheeks flushed with spiced wine and revels. If you were a storyteller in the twelfth century you might be weaving in and out of the rumpus, noticing the town bully pinching the farmer’s wife or schoolchildren slinking off in the shadows to practice kissing, all tidbits for your stories. You might wassail the trees, toasting them with a heady brew in anticipation of their spring blooms brought on by the increasing warmth of the sun. Happy Solstice! Happy Solstice! And to you dear writers in the 21st century, as the sun brings us increasing light day by day after the solstice, may you find more and more light in your writing. May you see ever more clearly the perfect word, the seamless phrase, the emerging idea. Just in case here’s a recipe for wassail adapted from nourishedkitchen.com. Serve in mugs. Bake on a cookie sheet in a 350 degree oven for forty minutes. 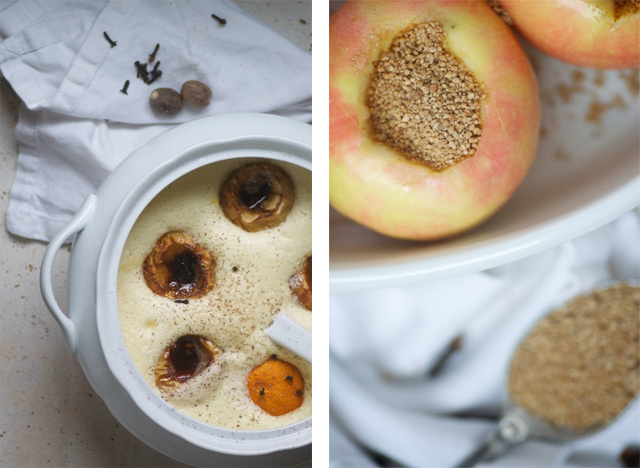 Pour the apple cider and brandy in a heavy bottomed pot and warm over moderately low heat. Wisk in the powdered ginger and nutmeg. Do not allow wassail to boil. Tie up the allspice berries and the cinnamon sticks in a square of cheesecloth and float this spice sachet in the wassail as it warms. Beat the egg yokes until light in color and set aside. In separate bowl whip the egg whites until stiff peaks form. Fold the yokes into the whites, then temper the eggs by slowly pouring ½ cup wassail into the eggs. Remove the spice sachet and slowly pour in the eggs. Transfer to a punch bowl and float the apples and orange on top. Thank you for what looks to be a marvelously tasting, festive treat. And thanks for reminding me that the winter solstice is the most opportune time to commit to bringing more light to my writing!